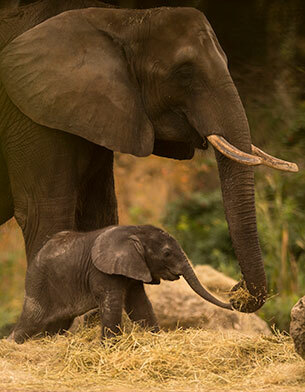 A new baby elephant calf has arrived at Animal Kingdom and is officially out for guests to view! The female elephant calf, Stella, is roaming the Savannah at Kilimanjaro Safaris. Stella is the third calf for the mother elephant, Donna, who is 28 years old. This new calf is the parks seventh elephant and brings the total number of elephants on the property to 10 total. "Donna became pregnant through natural breeding in January 2015 and received extensive pre-natal care throughout her pregnancy. In addition to regular ultrasounds, veterinarians, scientists and elephant managers monitored Donna’s hormone levels on a daily basis to help them determine when she would give birth." For years, Disney has been a proud and important piece of the conservation effort aimed to increase elephant numbers and learn more about the animal through research and understanding. To see Stella for yourself, head on over to Animal Kingdom or check out the video released by Disney below! Enjoy this article? Please SHARE it with friends and hit that subscribe button over on the right!